Aqeela Asifi made it her mission over more than 20 years in exile to bring education to refugee girls in a remote community in Pakistan. 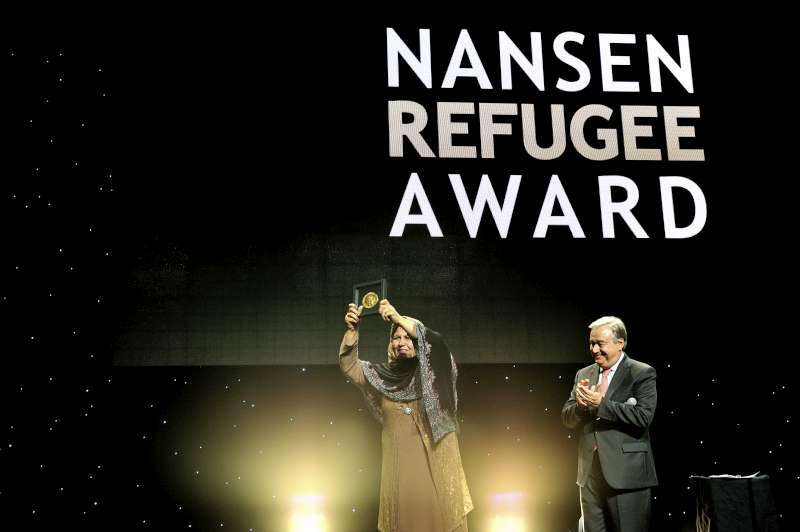 Asifi has been recognised for her tireless dedication to education for Afghan refugee girls in the Kot Chandana refugee village in Mianwali, Pakistan – while herself overcoming the struggles of life in exile. Despite minimal resources and significant cultural challenges, Asifi has guided a thousand refugee girls through their primary education. “When I first set up my school I was not very optimistic. This success is beyond my expectations. Let the dove of peace be our messenger, let us shun the culture of war and weapons and let us promote the culture of pen and education. That’s the only way, my dear brothers and sisters, that we can bring peace and prosperity to our country.” Asifi said. The Award ceremony, in Geneva’s Bâtiment des Forces Motrices, featured performances from UNICEF Goodwill Ambassador and two-time Grammy winner, Angelique Kidjo, and UNHCR Honorary Lifetime Goodwill Ambassador, Barbara Hendricks. This entry was posted on	October 6, 2015 at 16:50	and is filed under awards, human rights, UN.